Sweet (Freedom) Giveaway–and Blog News! The site was set up and arranged by Blain Smith of 13 Infinite. It’s been a pleasure to work with him on this–Blain’s communication style is easy and relaxed, yet always professional. He’s also been very accommodating and incredibly quick about responding to all my emails regarding the site (not to mention very patient with my sometimes endless questions and requests!). If you’re looking to set up a new blog, I’d highly recommend him. Next, the cookbook news: my cookbook finally has a cover! Finally, the Double Giveaway News!! I am very excited for this giveaway because it’s the perfect melding of my new blog, my new cookbook, and a product I love! Win a quart-sized jug of Coombs Family Farms Pure Maple Syrup! With a full quart (about a liter) of pure maple syrup, you can bake every maple-based recipe on this blog, and probably all the maple-based recipes in my new book, too! And I can’t wait for one of you to sample this extraordinary product as well, and tell me what you think! A custom-baked chocolate layer cake from the Sweet Freedom recipe–made to your specifications! After I posted about the cake I made for my friend Eternal Optimist’s birthday, I was touched by so many positive comments about the cake. This is the same recipe I used for several years when I baked birthday cakes for kids with food sensitivities to wheat, eggs, dairy and refined sugar–and was a regular hit with the kids and adults alike (low-gluten, but not gluten free). The 9-inch layer cake serves 10-12 people comfortably. Message of your choice in any color frosting (or no message–it’s up to you). I’ll deliver the cake freshly baked and frosted so it’s ready to serve! 2) what you like best about the new blog if you can’t think of anything you’d like to be different. FOR A CHANCE AT TWO EXTRA ENTRIES, simply mention the contest on your own blog, if you have one, and link to this very page on the new blog (ie, this page). Don’t have a blog? You can still earn two extra entries! Simply browse through the Recipe Index on the new DDD and choose a favorite recipe that uses maple syrup (some of the links haven’t been shifted to the new blog yet, so you might still be in the old blog when you click on a recipe title–I’m in the process of changing them all over). Then comment again, letting me know which one you like best, and why–and you’ll be entered two more times. Please be sure to include a valid email address so I can get in touch with you if you win. Once the contest closes, I’ll choose two winners from a bag of names. The first Toronto-area name I withdraw will win the cake. Then all the other names go back into the bag for the maple syrup draw, and the second name I choose wins that. Deadline for entries is midnight, March 31, 2009, Toronto time. Winners will be announced first thing on April 2, 2009 (I wouldn’t dare post contest winners on April Fool’s Day!). I loved baking up a storm for the previous giveaway, and was thrilled with Lisa’s kind words about the Sweet Freedom goodies. I can’t wait to get baking on this cake for you this time round as well. And even if you can’t win the cake, you’re still eligible to win the syrup–so you can then bake your own delectable treats! Well, the results are in and we have our winners of the Ritter Sport and Sweet Freedom goodie pack contest! Here’s how I selected them: First, I went to Random.org and asked for 6 random numbers between 1 and 120. Then I went through the numbers in the order they appeared in the random list. The first entry from Toronto won the baked goods; after that, everyone else (whether from Toronto or not) won a Peppermint Ritter Sport. I’ve copied and pasted the list here. I’m afraid I don’t know how to capture the screen exactly as it looks on the Random. org page (can anyone help me with that? ), but I promise that this is the actual list that appeared when I hit the “Get Numbers” button. And if anyone can tell me how to copy the content from the original page onto my blog (for the next contest), I’d be much obliged! 26: VEGAN LISA–YOU WIN THE TREATS!! Congratulations to all the winners! I’ll be contacting you via email. And if you happen to read this before you hear from me, please email me at dietdessertdogs AT gmail DOT com to get in touch! This was really a fun contest for me. I loved reading all the entries, and your enthusiasm was contagious! Thanks, everyone, for entering. And as I mentioned before, there will be one contest each month until the cookbook is published, so you can always enter again later for another chance to win! Have a great weekend (and to my American friends, enjoy the Superbowl–but honestly, does anyone really enjoy the Superbowl??). Really, you guys are so great that I think YOU deserve an award. And so, time for ME to offer a couple of prizes to YOU! YES, IT’S CONTEST TIME AT DDD! In honor of Tuesday’s historically transformative event (Obama’s, not mine), I’ve decided to present my own little contribution to US-Canada relations. Some of you may have heard (though I doubt it) that CBC Radio compiled a list of the 49 top songs north of the 49th parallel (ie, by Canadian artists) to bestow upon President Obama as a gift for his inauguration. (Honestly, do they think he cares? I have a feeling the guy’s got other things on his mind at the moment). I must admit, though, I was surprised to see how many iconic American songs were actually written by Canadians. Well, in honour of the new Mr. and Mrs. President, I’ve decided to offer my own little cross-border gift. It’s my way of saying, “hey, neighbor!” to those of you south of the world’s longest undefended border (and those of you within the Canadian border, too, if you happen to win the contest). Actually, I’m giving away six prizes! SIX ! ! ! ! ! ! (And I am really, REALLY sorry that I can’t send beyond that undefended border; but the Canadian postal system is pretty wacky and not all that efficient, and it would take far too long to get to you–not to mention it would cost me three months’ salary). You may have read on Mihl’s blog a while back that the Ritter Sport people (who make a few very fine vegan chocolates) have, in their infinite wisdom, altered their peppermint formula so that it’s no longer vegan. Well, darned if there isn’t at least one advantage to living up here in the snowy north: since our stock doesn’t sell as fast as it does in the States (what with only 1/10 the population), those minty bars are all over the place on our grocery store shelves! I double-checked the ingredients to be sure these were the “old” forumla, and then grabbed a whole stack of bars. And I can’t wait to send them along to FIVE (5) lucky readers! To win one, just follow the contest rules, at the end of this post. (Again, how I wish I could extend the boundaries of this one, but you’ll see why I can’t in a moment). As many of you know, I’ve just completed the manuscript for my upcoming cookbook, Sweet Freedom. (According to my publisher, it should be available mid-April; I’m hoping that’s a firm date!). The recipes are all free of wheat, eggs, dairy and refined sweeteners–in other words, all are vegan, kosher-friendly, lactose free and casein free; and many are gluten free. And here’s your chance to experience the delectable taste of goodies made with these whole, healthy ingredients first hand! To help you become familiar with the types of desserts in the book, I’m giving away a prize pack of homebaked (by yours truly) goodies from recipes in the book. I’ll bake up any five types of cookie, bar, muffin or biscuit from those pictured on this page (and those listed at the bottom). As the winner, you get to choose which five you’d like! Then, I’ll deliver them to you, within the general Toronto area (Lake Ontario to the south; Highway 427 to the west; Highway 9 to the north; Highway 48 to the east). If you live within those boundaries–or if you’re willing to meet me at an agreed-upon location within them–you’re eligible to win the prize pack! Because these are freshly baked and hand-delivered, I’m afraid I can’t send them through the mail. (I did try, once, to send my goodies to the States and they were stale, broken and really unappetizing by the time they arrived, so I’ve ruled that out this time). I actually have no idea how many of you live in the Toronto area (I’m woefully deficient in techy skills so don’t know those stats). But think of it this way: if there are only three of you, your chances of winning just increased exponentially! To win either of the prizes, all you need to do is leave a comment at the bottom of this post, any time between now and January 30th. (Oh, and vote for me on the Food Blog Awards, or your entry is disqualified). But you did look rather pale there for a second. You can also receive an additional entry, just by mentioning the contest on your own blog (with a link back to this post). Be sure to let me know you’ve mentioned it, though, either through a trackback or through your comment here. And the recipes for every one of the treats pictured here will be in the book. I’d love to bake for you! So go ahead and leave those comments, and let me know which goodies you’d like in your gift pack! (And don’t forget, if you have a blog, you can enter again by mentioning the contest and linking to this page on your own blog). And if you’re not in the Toronto area, don’t worry–I’ll be holding one Sweet Freedom-related contest every month, right up until the book comes out. Oh, and I promise to post an actual recipe next time. 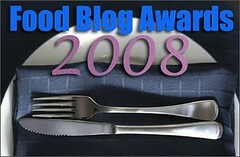 FIRST ANNOUNCEMENT: DDD IS A FOOD BLOG AWARD FINALIST! A huge THANK YOU to Tea of Tea and Cookies for letting me know that my l’il blog has been chosen as one of five finalists in the Well Fed Network’s Food Blog Awards for 2008–in the “Best Food Blog: Writing” category! WHOO HOO!!!! YIPPEEE!!!! YAY!!! WHEEEEEE! ACHOOO!!!! YOWZA!!! (Sorry about the sneeze in there–just SO DARNED EXCITED!). THANK YOU, to each and every one of you who visits this site regularly, who reads this blog and has provided such amazing encouragement and feedback over the past year, to those who suggested DDD for the award, and to the judges for choosing it. I have no doubt that this nomination is a direct result of all your support and comments! I can’t tell you all how thrilled I am to be nominated! (But I’m gonna try. . . ). But the voting starts TODAY–so please vote! Voting extends to 8:00 PM on Saturday, January 24th, so you can celebrate Obama’s inauguration and still have time to vote! If you like DDD and think this blog deserves to win. . . Votes must be registered through the official Well Fed Network page, so be sure to click through from there. And please spread the word in case others aren’t aware of the awards! And one more time, THANK YOU. Have I ever mentioned that I think food bloggers and readers are THE BEST? Well, we have a winner of the cookbook contest! First, thank you all so much for your entries; it was wonderful to learn about so many new cookbooks! I’m definitely going to have to get The Passionate Vegetarian–I mean, with an author named Crescent Dragonwagon, how could I resist? Thanks, Jackie and Astra! I think I’ll also look into The New Farm Vegetarian (thanks, Shelly); Madhur Jaffrey’s World Vegetarian (thanks, Holler and Brett); ReFresh (thanks, Brandy and Debyi); The Crank’s Bible (thanks, Sue); Going Wild in the Kitchen (thanks, Cheryl); and the classic Linda McCartney’s Home Cooking (thanks, Courtney). Oh, and Vijita–how lucky for you to have stayed at Laura’s B&B! Really, all your descriptions sounded so good, I think I want to go out and buy them all. And I loved the memories brought back by Megan’s mention of the Betty Crocker book (my mom used to make cookies from it all the time), Michelle’s mention of the Silver Palate (I still love that one! ), and Hallie’s mention of Joy of Cooking (it really is a great reference, isn’t it?). So, the lucky winner is number 54–Katy! Katy, please contact me via email (at dietdessertdogs AT gmail DOT com, or just leave a comment on this post) so you can tell me which book you’d like from the list, as well as your address so I can mail you your book. Congratulations! Thanks again, everyone. This was really fun! And most importantly, thanks for all your support over these past 230 days (now 235! ), visiting the blog, continuing to read, and providing your great feedback. What did I ever do before I discovered blogging?